Baba Dhansar Temple is located 15 km away from Katra on way to Salal Dam. 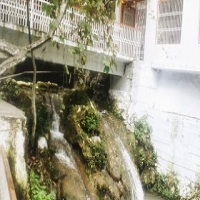 A huge spring emerging from the rocks forms a number of small cascading waterfalls before flowing into the holy river that merges with the Chenab River. At Baba Dhansar Temple, devotees find a naturally formed Shivling, on which droplets of water fall at a constant pace throughout the year.